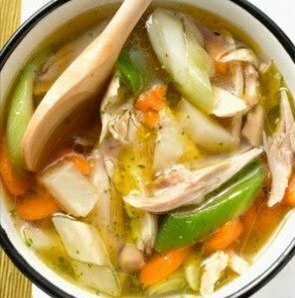 There is no question in the world about it: Chicken soup is good for the soul, because it builds your immune system. Jewish penicillin, for sure, chicken soup is the fastest and best way to cure what ills you. It’s also a great way to prevent illness. I make it once a week for my family, even in the summer months, and we are proud to say we rarely get sick. I am sure my home made chicken soup is one of the reasons why. a whole onion cut in chunks, five carrots, peeled and cut, five sticks of celery in chunks, four cloves of garlic, five peppercorns, a bay leaf, two to four chicken feet, nails cut off. The chicken feet are available online if you cannot source them locally. Many Whole Foods markets will stock them in their meat section. Add all the ingredients to the pressure cooker, cover with filtered water until about two inches from the top. Seal and lock the pressure cooker and turn it on high. Watch it checking every five minutes until the seal closes, then let it cook for 20 minutes. Be careful, as they can explode if left unmonitored. Once it has been cooking 20 minutes, remove from heat. Let cool, possibly overnight, then drain broth and discard the rest. Pour the broth in a large stock pot, add chicken tenders (one to two packages, organic and hormone and steroid free), add the same vegetables as above without the garlic, simmer for 45 minutes or longer. Salt and pepper to taste, serve over soaked whole grain cooked brown rice and squeeze fresh lemon juice on top. 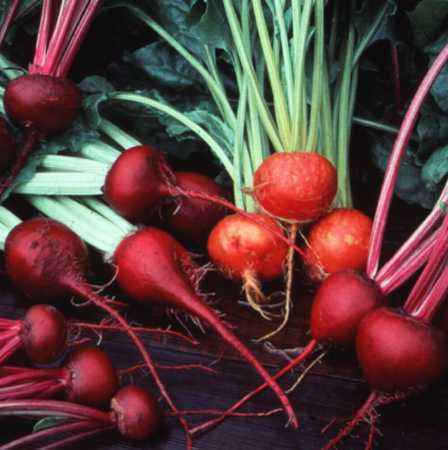 Beets are practically a super food, and are a great sweet root veggie for the fall. Kids will usually eat them no problem! Cut off stems, peel the beet and cut it into chunks. Simmer on medium heat for 30-40 minutes in a bit of water, monitoring to make sure you have enough water in the pan so the beets will get tender but not burn. Serve when cooled. Do the same with carrots, as another root veggie, only add ghee and mustard seeds to the carrots — you will love the taste! Sweet potatoes are another root vegetable — peel, cut into long strips, toss with light olive oil and salt and pepper, and place on a cookie sheet. Cook on 350 degrees in the oven for 15 minutes. Kids eat em up! Previous ArticleIs Sugar Toxic for Kids?